UPDATE! – MAJOR CHANGE TO SUPERFOGEYS VOL. 1!! 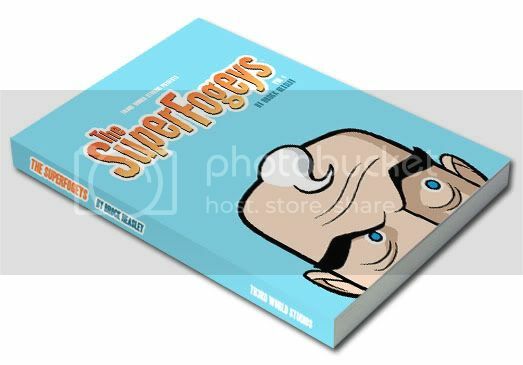 As you know, I’ve been working hard on putting together the first SuperFogeys trade paperback. This week I finally got all the strips rewritten and re-edited (mostly just to make it a smoother read and not so “strippy”), and I also did some art tweaks here and there (like fixing Dr. Rocket’s hair in the flashbacks to match what T.L. is doing over in Origins). In the process of doing all that, I discovered that I had a lot more room than I thought I did and so I’m pleased to announce that Vol. 1 now includes all of Chapter 5, “The Redemption of Dr. Rocket”, along with its accompanying bonus story “The Audition” with art by Lucas Turnbloom! UH OH. DOES THIS MEAN THE PRICE JUST WENT UP? NO! This is the best part–the price is staying the same, even with the additional pages. $19.99 for the Regular Edition, $24.99 for the Artist Edition. OKAY, SMART GUY, HOW MANY PAGES WE TALKING HERE? The exact count is still being worked on, but I can tell you it will be over 100 pages. But, honestly, there’s a lot more content than that number suggests. Each page has three strips, and each bonus story is printed as 1 page for every 2. You’re not gonna be breezing through this thing. Print run is small on this one, limited to 100 copies. If you haven’t ordered yours yet and are planning on doing so, I’d say now’s the time. Order the Artist Edition here. Order the Regular Edition here. Big thanks to Digital Strips, David Reddick, Steve Ogden and whoever else has been helping spread the word about this book!